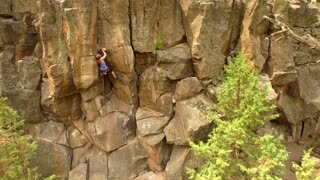 Search Results for "woman rock climbing"
Woman rock climbing high mountain canyon cliff DCI 4K 1249. Utah Rock climbing world famous destination, Maple Canyon. Cliffs, overhangs challenging climbs day adventure, recreation, sport and strength endurance. Rural community mountain area. Woman rock climbing getting back close to the stone wall to continue to climb after a fall. Security gear, harness, helmet and rope. Extreme risk sport. Slow motion 120 fps, Patagonia Argentina. 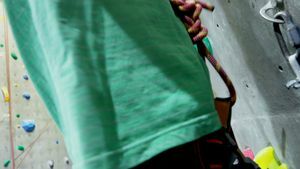 An elderly woman gets tied into a harness by another woman for rock climbing. 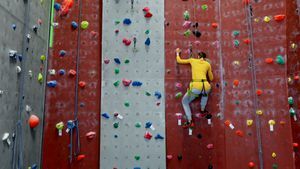 Close-up of rock climbing on wall in gym of a young woman. 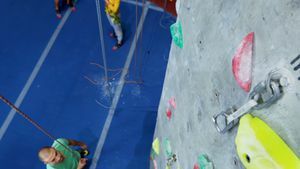 Sports female figure is kept by feet on hooks on artificial rock climbing and rises upward. Detail of rock climbing woman adjusting and regulating the harness about to climb. Slow motion 120 fps. Patagonia Argentina. Risk outdoor sport. 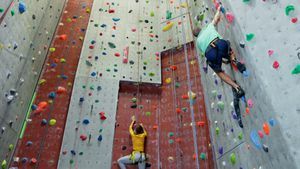 Sporty man and woman having competition at rock climbing gym. Low angle view. 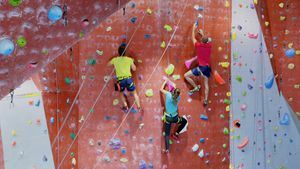 Fit woman and man training at rock climbing wall. Low angle view. Red, grey and black background.